Here's another prime example of aquascaping- an art form I first learned about through an LA Times article a while back. Now we see the stellar arrangements from the Aqua Forrest Aquarium shop as featured in the SF Chronicle and Apartmenttherapy.com. I can just imagine the water moss flowing in the "breeze" and the school of fish a cloud of butterflies. Oh! Good God you have great taste! I have been drooling over these for years! 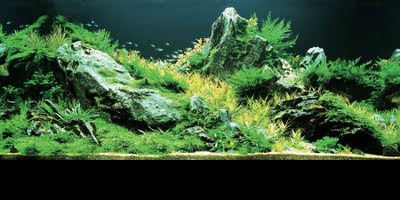 Everyone... look at the pictures in the gallery of the Aqua Forest Aquarium website. As a child, I never would have thought that the freshwater aquarium could be raised to such and art!